This article is about the states of modern Germany. For other uses, see States of Germany (disambiguation). "Regions of Germany" redirects here. For other uses, see Regions of Germany (disambiguation). Germany is a federal republic consisting of sixteen states (German: Land, plural Länder; commonly informally Bundesland and Bundesländer). [a] Since today's Germany was formed from an earlier collection of several states, it has a federal constitution, and the constituent states retain a measure of sovereignty. With an emphasis on geographical conditions, Berlin and Hamburg are frequently called Stadtstaaten (city-states), as is the Free Hanseatic City of Bremen, which in fact includes the cities of Bremen and Bremerhaven. The remaining 13 states are called Flächenländer (literally: "area states"). The creation of the Federal Republic of Germany in 1949 was through the unification of the western states (which were previously under American, British, and French administration) created in the aftermath of World War II. Initially, in 1949, the states of the Federal Republic were Baden (until 1952), Bavaria (in German: Bayern), Bremen, Hamburg, Hesse (Hessen), Lower Saxony (Niedersachsen), North Rhine-Westphalia (Nordrhein-Westfalen), Rhineland-Palatinate (Rheinland-Pfalz), Schleswig-Holstein, Württemberg-Baden (until 1952), and Württemberg-Hohenzollern (until 1952). West Berlin, while officially not part of the Federal Republic, was largely integrated and considered as a de facto state. In 1952, following a referendum, Baden, Württemberg-Baden, and Württemberg-Hohenzollern merged into Baden-Württemberg. In 1957, the Saar Protectorate rejoined the Federal Republic as the Saarland. German reunification in 1990, in which the area of the German Democratic Republic (East Germany) became part of the Federal Republic, was performed by the way of ascent of the re-established eastern states of Brandenburg, Mecklenburg-West Pomerania (Mecklenburg-Vorpommern), Saxony (Sachsen), Saxony-Anhalt (Sachsen-Anhalt), and Thuringia (Thüringen) to the Federal Republic, as well as the de-facto reunification of West and East Berlin into Berlin and its establishment as a full and equal state. 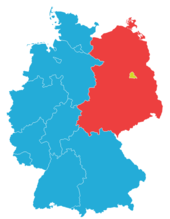 A regional referendum in 1996 to merge Berlin with surrounding Brandenburg as "Berlin-Brandenburg" failed to reach the necessary majority vote in Brandenburg, while a majority of Berliners voted in favour of the merger. Federalism is one of the entrenched constitutional principles of Germany. According to the German constitution (Basic Law, or Grundgesetz), some topics, such as foreign affairs and defence, are the exclusive responsibility of the federation (i.e., the federal level), while others fall under the shared authority of the states and the federation; the states retain residual legislative authority for all other areas, including "culture", which in Germany includes not only topics such as financial promotion of arts and sciences, but also most forms of education and job training. Though international relations including international treaties are primarily the responsibility of the federal level, the constituent states have certain limited powers in this area: in matters that affect them directly, the states defend their interests at the federal level through the Bundesrat ("Federal Council", the upper house of the German Federal Parliament) and in areas where they have legislative authority they have limited powers to conclude international treaties "with the consent of the federal government". After 1945, new states were constituted in all four zones of occupation. 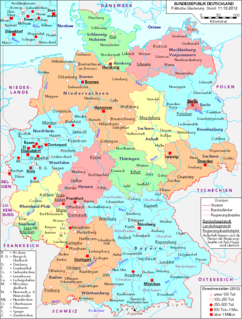 In 1949, the states in the three western zones formed the Federal Republic of Germany. This is in contrast to the post-war development in Austria, where the Bund (federation) was constituted first, and then the individual states were created as units of a federal state. The other 10 states either merged into one another or were separated into smaller entities. Prussia is now separated into the states of Berlin, Brandenburg, Lower Saxony, North Rhine-Westphalia, Rhineland-Palatinate, Saxony-Anhalt and Schleswig-Holstein. Also, all other states, except Bremen and Bavaria, include former Prussian territory. Former Prussian territory east of the rivers Neisse and Oder is now part of Poland and Russia. A new delimitation of the federal territory keeps being debated in Germany, in contrast to how there are "significant differences among the American states and regional governments in other federations without serious calls for territorial changes" in those other countries. Arthur B. Gunlicks summarizes the main arguments for boundary reform in Germany: "the German system of dual federalism requires strong Länder that have the administrative and fiscal capacity to implement legislation and pay for it from own source revenues. Too many Länder also make coordination among them and with the federation more complicated". But several proposals have failed so far; territorial reform remains a controversial topic in German politics and public perception. Federalism has a long tradition in German history. The Holy Roman Empire comprised many petty states, numbering more than 300 around 1796. The number of territories was greatly reduced during the Napoleonic Wars (1796–1814). After the Congress of Vienna (1815), 39 states formed the German Confederation. The Confederation was dissolved after the Austro-Prussian War. Prussia and the other states in Northern and Central Germany united as a federal state, the North German Federation, on July 1, 1867. The Southern states Bavaria, Württemberg, Baden and Hesse-Darmstadt entered military alliances with Prussia. In the Franco-Prussian War of 1870–71, those states joined the North German Federation. It was consequently renamed to German Empire, and the parliament and Federal Council decided to give the Prussian king the title of German Emperor (since January 1, 1871). The new German Empire included 25 states (three of them, Hanseatic cities) and the imperial territory of Alsace-Lorraine. Within the empire, 65% of the territory and 62% of the population belonged to the state of Prussia. After the territorial losses of the Treaty of Versailles, the remaining states continued as republics of a new German federation. These states were gradually de facto abolished and reduced to provinces under the Nazi regime via the Gleichschaltung process, as the states administratively were largely superseded by the Nazi Gau system. During the Allied occupation of Germany after World War II, internal borders were redrawn by the Allied military governments. No single state comprised more than 30% of either population or territory; this was intended to prevent any one state from being as dominant within Germany as Prussia had been in the past. Initially, only seven of the pre-War states remained: Baden (in part), Bavaria (reduced in size), Bremen, Hamburg, Hesse (enlarged), Saxony, and Thuringia. The states with hyphenated names, such as Rhineland-Palatinate, North Rhine-Westphalia, and Saxony-Anhalt, owed their existence to the occupation powers and were created out of mergers of former Prussian provinces and smaller states. Former German territory that lie east of the Oder-Neisse line fell under either Polish or Soviet administration but attempts were made at least symbolically not to abandon sovereignty well into the 1960s. The former provinces of East Prussia, Posen, Silesia and West Prussia fell under Polish administration with the Soviet Union taking the area around Koenigsburg (now Kaliningrad). However, no attempts were made to establish new states in these territories, as they lay outside the jurisdiction of West Germany at that time. Furthermore, the former eastern territories had either been ethnically cleansed from their autochthonous German population and therefore had ceased being part of the German speaking lands. Upon its founding in 1949, West Germany had eleven states. These were reduced to nine in 1952 when three south-western states (South Baden, Württemberg-Hohenzollern, and Württemberg-Baden) merged to form Baden-Württemberg. From 1957, when the French-occupied Saar Protectorate was returned and formed into the Saarland, the Federal Republic consisted of ten states, which are referred to as the "Old States" today. West Berlin was under the sovereignty of the Western Allies and neither a Western German state nor part of one. However, it was in many ways de facto integrated with West Germany under a special status. 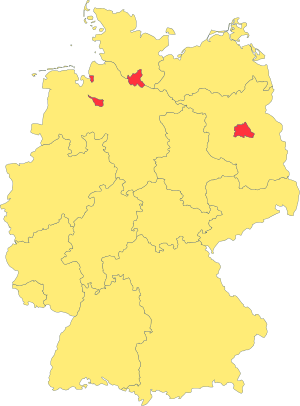 East Germany originally consisted of five states (i.e., Brandenburg, Mecklenburg-Vorpommern, Saxony, Saxony-Anhalt, and Thuringia). In 1952, these states were abolished and the East was divided into 14 administrative districts called Bezirke. Soviet-controlled East Berlin – despite officially having the same status as West Berlin – was declared East Germany's capital and its 15th district. Just prior to the German reunification on 3 October 1990, the East German states were reconstituted close to their earlier configuration as the five "New States". The former district of East Berlin joined West Berlin to form the new state of Berlin. Henceforth, the 10 "old states" plus 5 "new states" plus the new state Berlin add up to current 16 states of Germany. Later, the constitution was amended to state that the citizens of the 16 states had successfully achieved the unity of Germany in free self-determination and that the Basic Law thus applied to the entire German people. Article 23, which had allowed "any other parts of Germany" to join, was rephrased. It had been used in 1957 to reintegrate the Saar Protectorate as the Saarland into the Federal Republic, and this was used as a model for German reunification in 1990. The amended article now defines the participation of the Federal Council and the 16 German states in matters concerning the European Union. The German states can conclude treaties with foreign countries in matters within their own sphere of competence and with the consent of the Federal Government (Article 32 of the Basic Law). Typical treaties relate to cultural relationships and economic affairs. Some states call themselves a “free state” (Freistaat). It is merely a historic synonym for “republic” and was a description used by most German states after the abolishment of monarchy after World War I. Today, Freistaat is associated emotionally with a more independent status, especially in Bavaria. However, it has no legal significance. All sixteen states are represented at the federal level in the Bundesrat (Federal Council), where their voting power depends on the size of their population. Article 29 of the Basic Law states that "the division of the federal territory into Länder}} may be revised to ensure that each Land be of a size and capacity to perform its functions effectively". The somewhat complicated provisions regulate that "revisions of the existing division into Länder shall be effected by a federal law, which must be confirmed by referendum". A new delimitation of the federal territory has been discussed since the Federal Republic was founded in 1949 and even before. Committees and expert commissions advocated a reduction of the number of states; academics (Rutz, Miegel, Ottnad etc.) and politicians (Döring, Apel, and others) made proposals – some of them far-reaching – for redrawing boundaries but hardly anything came of these public discussions. Territorial reform is sometimes propagated by the richer states as a means to avoid or reduce fiscal transfers. To date, the only successful reform was the merger of the states of Baden, Württemberg-Baden, and Württemberg-Hohenzollern to form the new state of Baden-Württemberg in 1952. Article 29 reflects a debate on territorial reform in Germany that is much older than the Basic Law. The Holy Roman Empire was a loose confederation of large and petty principalities under the nominal suzerainty of the emperor. Approximately 300 states existed at the eve of the French Revolution in 1789. Territorial boundaries were essentially redrawn as a result of military conflicts and interventions from the outside: from the Napoleonic Wars to the Congress of Vienna, the number of territories decreased from about 300 to 39; in 1866 Prussia annexed the sovereign states of Hanover, Nassau, Hesse-Kassel, and the Free City of Frankfurt; the last consolidation came about under Allied occupation after 1945. The debate on a new delimitation of the German territory started in 1919 as part of discussions about the new constitution. Hugo Preuss, the father of the Weimar Constitution, drafted a plan to divide the German Reich into 14 roughly equal-sized states. His proposal was turned down due to opposition of the states and concerns of the government. Article 18 of the constitution enabled a new delimitation of the German territory but set high hurdles: "Three fifth of the votes handed in, and at least the majority of the population are necessary to decide on the alteration of territory". In fact, until 1933 there were only four changes in the configuration of the German states: The 7 Thuringian states were merged in 1920, whereby Coburg opted for Bavaria, Pyrmont joined Prussia in 1922, and Waldeck did so in 1929. Any later plans to break up the dominating Prussia into smaller states failed because political circumstances were not favourable to state reforms. After the Nazi Party seized power in January 1933, the Länder increasingly lost importance. They became administrative regions of a centralised country. Three changes are of particular note: on January 1, 1934, Mecklenburg-Schwerin was united with the neighbouring Mecklenburg-Strelitz; and, by the Greater Hamburg Act (Groß-Hamburg-Gesetz) of 1937, the area of the city-state was extended, while Lübeck lost its independence and became part of the Prussian province of Schleswig-Holstein. Between 1945 and 1947, new states were established in all four zones of occupation: Bremen, Hesse, Württemberg-Baden, and Bavaria in the American zone; Hamburg, Schleswig-Holstein, Lower Saxony, and North Rhine-Westphalia in the British zone; Rhineland-Palatinate, Baden, Württemberg-Hohenzollern and the Saarland – which later received a special status – in the French zone; Mecklenburg(-Vorpommern), Brandenburg, Saxony, Saxony-Anhalt, and Thuringia in the Soviet zone. In 1948, the military governors of the three Western Allies handed over the so-called Frankfurt Documents to the minister-presidents in the Western occupation zones. Among other things, they recommended revising the boundaries of the West German states in a way that none of them should be too large or too small in comparison with the others. As the premiers did not come to an agreement on this question, the Parliamentary Council was supposed to address this issue. Its provisions are reflected in Article 29. There was a binding provision for a new delimitation of the federal territory: the Federal Territory must be revised (paragraph 1). Moreover, in territories or parts of territories whose affiliation with a Land had changed after 8 May 1945 without a referendum, people were allowed to petition for a revision of the current status within a year after the promulgation of the Basic Law (paragraph 2). If at least one tenth of those entitled to vote in Bundestag elections were in favour of a revision, the federal government had to include the proposal into its legislation. Then a referendum was required in each territory or part of a territory whose affiliation was to be changed (paragraph 3). The proposal should not take effect if within any of the affected territories a majority rejected the change. In this case, the bill had to be introduced again and after passing had to be confirmed by referendum in the Federal Republic as a whole (paragraph 4). The reorganization should be completed within three years after the Basic Law had come into force (paragraph 6). In their letter to Konrad Adenauer, the three western military governors approved the Basic Law but suspended Article 29 until such time as a peace treaty should be concluded. Only the special arrangement for the southwest under Article 118 could enter into force. In southwestern Germany, territorial revision seemed to be a top priority since the border between the French and American occupation zones was set along the Autobahn Karlsruhe-Stuttgart-Ulm (today the A8). Article 118 stated "The division of the territory comprising Baden, Württemberg-Baden and Württemberg-Hohenzollern into Länder may be revised, without regard to the provisions of Article 29, by agreement between the Länder concerned. If no agreement is reached, the revision shall be effected by a federal law, which shall provide for an advisory referendum." Since no agreement was reached, a referendum was held on 9 December 1951 in four different voting districts, three of which approved the merger (South Baden refused but was overruled, as the result of total votes was decisive). On 25 April 1952, the three former states merged to form Baden-Württemberg. The last petition was originally rejected by the Federal Minister of the Interior in reference to the referendum of 1951. However, the Federal Constitutional Court of Germany ruled that the rejection was unlawful: the population of Baden had the right to a new referendum because the one of 1951 had taken place under different rules from the ones provided for by article 29. In particular, the outcome of the 1951 referendum did not reflect the wishes of the majority of Baden's population. The two Palatine petitions (for a reintegration into Bavaria and integration into Baden-Württemberg) failed with 7.6% and 9.3%. Further requests for petitions (Lübeck, Geesthacht, Lindau, Achberg, and 62 Hessian communities) had already been rejected as inadmissible by the Federal Minister of the Interior or were withdrawn as in the case of Lindau. The rejection was confirmed by the Federal Constitutional Court in the case of Lübeck. In the Paris Agreements of 23 October 1954, France offered to establish an independent "Saarland", under the auspices of the Western European Union (WEU), but on 23 October 1955 in the Saar Statute referendum the Saar electorate rejected this plan by 67.7% to 32.3% (out of a 96.5% turnout: 423,434 against, 201,975 for) despite the public support of Federal German Chancellor Konrad Adenauer for the plan. The rejection of the plan by the Saarlanders was interpreted as support for the Saar to join the Federal Republic of Germany. On October 27, 1956, the Saar Treaty established that Saarland should be allowed to join Germany, as provided by the Grundgesetz constitution art. 23 for the Federal Republic of Germany. Saarland became part of Germany effective January 1, 1957. The Franco-Saarlander currency union ended on 6 July 1959, when the Deutsche Mark was introduced as legal tender in the Saarland. Paragraph 6 of Article 29 stated that, if a petition was successful, a referendum should be held within three years. Since the deadline passed on 5 May 1958 without anything happening, the Hesse state government filed a constitutional complaint with the Federal Constitutional Court in October 1958. The complaint was dismissed in July 1961 on the grounds that Article 29 had made the new delimitation of the federal territory an exclusively federal matter. At the same time, the Court reaffirmed the requirement for a territorial revision as a binding order to the relevant constitutional bodies. The grand coalition decided to settle the 1956 petitions by setting binding deadlines for the required referendums. The referendums in Lower Saxony and Rhineland-Palatinate were to be held by 31 March 1975, and the referendum in Baden was to be held by 30 June 1970. The quorum for a successful vote was set at one-quarter of those entitled to vote in Bundestag elections. Paragraph 4 stated that the vote should be disregarded if it contradicted the objectives of paragraph 1. In his investiture address, given on 28 October 1969 in Bonn, Chancellor Willy Brandt proposed that the government would consider Article 29 of the Basic Law as a binding order. An expert commission was established, named after its chairman, the former Secretary of State Professor Werner Ernst. After two years of work, the experts delivered their report in 1973. It provided an alternative proposal for the two regions: the north and center-southwest. In the north, either a single new state consisting of Schleswig-Holstein, Hamburg, Bremen and Lower Saxony should be created (solution A) or two new states, one in the northeast consisting of Schleswig-Holstein, Hamburg and the northern part of Lower Saxony (from Cuxhaven to Lüchow-Dannenberg) and one in the northwest consisting of Bremen and the rest of Lower Saxony (solution B). In the center and southwest, either Rhineland-Palatinate (with the exception of the Germersheim district but including the Rhine-Neckar region) should be merged with Hesse and the Saarland (solution C), the district of Germersheim would then become part of Baden-Württemberg. The Palatinate (including the region of Worms) could also be merged with the Saarland and Baden-Württemberg, and the rest of Rhineland-Palatinate would then merge with Hesse (solution D). Both alternatives could be combined (AC, BC, AD, BD). At the same time the commission developed criteria for classifying the terms of Article 29 Paragraph 1. The capacity to perform functions effectively was considered most important, whereas regional, historical, and cultural ties were considered as hardly verifiable. To fulfill administrative duties adequately, a population of at least five million per state was considered as necessary. After a relatively brief discussion and mostly negative responses from the affected states, the proposals were shelved. Public interest was limited or nonexistent. Hence, the two referendums in Lower Saxony were successful. As a consequence, the legislature was forced to act and decided that both Oldenburg and Schaumburg-Lippe should remain part of Lower Saxony. The justification was that a reconstitution of Oldenburg and Schaumburg-Lippe would contradict the objectives of paragraph 1. An appeal against the decision was rejected as inadmissible by the Federal Constitutional Court. On 24 August 1976, the binding provision for a new delimitation of the federal territory was altered into a mere discretionary one. Paragraph 1 was rephrased, now putting the capacity to perform functions in the first place. The option for a referendum in the Federal Republic as a whole (paragraph 4) was abolished. Hence a territorial revision was no longer possible against the will of the population affected by it. The debate on territorial revision restarted shortly before German reunification. While academics (Rutz and others) and politicians (Gobrecht) suggested introducing only two, three, or four states in East Germany, legislation reconstituted the five states that had existed until 1952, however, with slightly changed boundaries. Article 118a was introduced into the Basic Law and provided the possibility for Berlin and Brandenburg to merge "without regard to the provisions of Article 29, by agreement between the two Länder with the participation of their inhabitants who are entitled to vote". Article 29 was again modified and provided an option for the states to "revise the division of their existing territory or parts of their territory by agreement without regard to the provisions of paragraphs (2) through (7)". The state treaty between Berlin and Brandenburg was approved in both parliaments with the necessary two-thirds majority, but in the popular referendum of 5 May 1996 about 63% voted against the merger. Germany is a federal, parliamentary, representative democratic republic. The German political system operates under a framework laid out in the 1949 constitutional document known as the Grundgesetz (Basic Law). By calling the document the Grundgesetz, rather than Verfassung (constitution), the authors expressed the intention that it would be replaced by a true constitution once Germany was reunited as one state. Amendments to the Grundgesetz generally require a two-thirds majority of both chambers of the parliament; the fundamental principles of the constitution, as expressed in the articles guaranteeing human dignity, the separation of powers, the federal structure, and the rule of law are valid in perpetuity. Despite the original intention, the Grundgesetz remained in effect after the German reunification in 1990, with only minor amendments. The Basic Law of the Federal Republic of Germany, the federal constitution, stipulates that the structure of each Federated State's government must "conform to the principles of republican, democratic, and social government, based on the rule of law" (Article 28). Most of the states are governed by a cabinet led by a Ministerpräsident (minister-president), together with a unicameral legislative body known as the Landtag (State Diet). The states are parliamentary republics and the relationship between their legislative and executive branches mirrors that of the federal system: the legislatures are popularly elected for four or five years (depending on the state), and the minister-president is then chosen by a majority vote among the Landtag’s members. The minister-president appoints a cabinet to run the state's agencies and to carry out the executive duties of the state's government. The governments in Berlin, Bremen and Hamburg are the "senates". 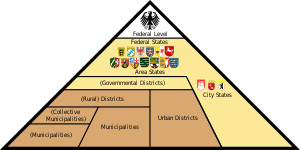 In the three free states of Bavaria, Saxony, and Thuringia, the government is the "state government" (Staatsregierung); and in the other ten states, the "Land government" (Landesregierung). Before January 1, 2000, Bavaria had a bicameral parliament, with a popularly elected Landtag, and a Senate made up of representatives of the state's major social and economic groups. The Senate was abolished following a referendum in 1998. The states of Berlin, Bremen, and Hamburg are governed slightly differently from the other states. In each of those cities, the executive branch consists of a Senate of approximately eight, selected by the state's parliament; the senators carry out duties equivalent to those of the ministers in the larger states. The equivalent of the minister-president is the Senatspräsident (president of the senate) in Bremen, the Erster Bürgermeister (first mayor) in Hamburg, and the Regierender Bürgermeister (governing mayor) in Berlin. The parliament for Berlin is called the Abgeordnetenhaus (House of Representatives), while Bremen and Hamburg both have a Bürgerschaft. The parliaments in the remaining 13 states are referred to as Landtag (State Parliament). The most populous state of North Rhine-Westphalia is uniquely divided into two area associations (Landschaftsverbände), one for the Rhineland, and one for Westphalia-Lippe. This arrangement was meant to ease the friction caused by uniting the two culturally different regions into a single state after World War II. The Landschaftsverbände now have very little power. The constitution of Mecklenburg-Vorpommern at §75 states the right of Mecklenburg and Vorpommern to form Landschaftsverbände, although these two constituent parts of the state are not represented in the current administrative division. The large states of Baden-Württemberg, Bavaria, Hesse, and North Rhine-Westphalia are divided into governmental districts, or Regierungsbezirke. In Rhineland-Palatinate, these districts were abolished on January 1, 2000, in Saxony-Anhalt on January 1, 2004, and in Lower Saxony on January 1, 2005. From 1990 until 2012, Saxony was divided into three districts (called Direktionsbezirke since 2008). In 2012, these districts' authorities were merged into one central authority, the Landesdirektion Sachsen [de]. Map of German districts. Yellow districts are urban, white are sub-urban or rural. The Districts of Germany (Kreise) are administrative districts, and every state except the city-states of Berlin and Hamburg and the state of Bremen consists of "rural districts" (Landkreise), District-free Towns/Cities (Kreisfreie Städte, in Baden-Württemberg also called "urban districts", or Stadtkreise), cities that are districts in their own right, or local associations of a special kind (Kommunalverbände besonderer Art), see below. The state Free Hanseatic City of Bremen consists of two urban districts, while Berlin and Hamburg are states and urban districts at the same time. As of 2011, there are 295 Landkreise and 107 Kreisfreie Städte, making 402 districts altogether. Each consists of an elected council and an executive, which is chosen either by the council or by the people, depending on the state, the duties of which are comparable to those of a county executive in the United States, supervising local government administration. The Landkreise have primary administrative functions in specific areas, such as highways, hospitals, and public utilities. Local associations of a special kind are an amalgamation of one or more Landkreise with one or more Kreisfreie Städte to form a replacement of the aforementioned administrative entities at the district level. They are intended to implement simplification of administration at that level. Typically, a district-free city or town and its urban hinterland are grouped into such an association, or Kommunalverband besonderer Art. Such an organization requires the issuing of special laws by the governing state, since they are not covered by the normal administrative structure of the respective states. In 2010 only three Kommunalverbände besonderer Art exist. District of Hanover: formed in 2001 from the rural district of Hanover and the district-free city of Hanover. Regionalverband (district association) of Saarbrücken: formed in 2008 from the Stadtverband Saarbrücken (city association of Saarbrücken), which was formed in 1974. City region of Aachen: formed in 2009 from the rural district of Aachen and the district-free city of Aachen. Ämter ("offices" or "bureaus"): In some states there is an administrative unit between the districts and the municipalities, called Ämter (singular Amt), Amtsgemeinden, Gemeindeverwaltungsverbände, Landgemeinden, Verbandsgemeinden, Verwaltungsgemeinschaften, or Kirchspiellandgemeinden. Municipalities (Gemeinden): Every rural district and every Amt is subdivided into municipalities, while every urban district is a municipality in its own right. There are (as of 6 March 2009[update]) 12,141 municipalities, which are the smallest administrative units in Germany. Cities and towns are municipalities as well, also having city rights or town rights (Stadtrechte). Nowadays, this is mostly just the right to be called a city or town. However, in former times there were many other privileges, including the right to impose local taxes or to allow industry only within city limits. The municipalities are ruled by elected councils and by an executive, the mayor, who is chosen either by the council or directly by the people, depending on the state. The "constitution" for the municipalities is created by the states and is uniform throughout a state (except for Bremen, which allows Bremerhaven to have its own constitution). The municipalities have two major policy responsibilities. First, they administer programs authorized by the federal or state government. Such programs typically relate to youth, schools, public health, and social assistance. Second, Article 28(2) of the Basic Law guarantees the municipalities "the right to regulate on their own responsibility all the affairs of the local community within the limits set by law." Under this broad statement of competence, local governments can justify a wide range of activities. For instance, many municipalities develop and expand the economic infrastructure of their communities through the development of industrial trading estates. Local authorities foster cultural activities by supporting local artists, building arts centres, and by holding fairs. Local government also provides public utilities, such as gas and electricity, as well as public transportation. The majority of the funding for municipalities is provided by higher levels of government rather than from taxes raised and collected directly by themselves. In five of the German states, there are unincorporated areas, in many cases unpopulated forest and mountain areas, but also four Bavarian lakes that are not part of any municipality. As of January 1, 2005, there were 246 such areas, with a total area of 4167.66 km2 or 1.2 percent of the total area of Germany. Only four unincorporated areas are populated, with a total population of about 2,000. The following table gives an overview. In 2000, the number of unincorporated areas was 295, with a total area of 4,890.33 square kilometres (1,888.17 sq mi). However, the unincorporated areas are continually being incorporated into neighboring municipalities, wholly or partially, most frequently in Bavaria. ^ Terminological note: The loan word Land is written with a capital "L" and is used in the official English version of the Basic Law and in UK parliamentary proceedings. The word Bundesland is very often used informally in German to avoid confusion, since Land can also mean ‘land’ or ‘country’ in German. This is sometimes translated to "Federal State" in English, even though federal state in English usually refers to the federation as a whole, and not its members. Although the term Land applies to all the states, each of the states of Bavaria, Saxony, and Thuringia describes itself as a Freistaat (free state). The expression is based on early 20th-century attempts to create a genuinely German alternative for the loan word Republik and to express the end of the German monarchies. ^ Christian Tomuschat, David P. Currie (April 2010). "Basic Law for the Federal Republic of Germany" (PDF). Deutscher Bundestag Public Relations Division. Retrieved 15 October 2010. ^ House of Commons of the United Kingdom (28 February 1991). "House of Commons debates (Welsh affairs)". UK parliament. Retrieved 19 April 2011. ^ Leonardy, Uwe (1999). "Länder Power-Sharing in International Relations and European Affairs". The institutional structures of German federalism. Working papers / Friedrich-Ebert-Stiftung, London Office (electronic ed.). Friedrich Ebert Foundation. ^ Gunlicks, Arthur B. "German Federalism and Recent Reform Efforts Archived 2011-06-21 at the Wayback Machine", German Law Journal, Vol. 06, No. 10, p. 1287. ^ The states of Baden, Württemberg-Baden, and Württemberg-Hohenzollern were constituent states of the federation when it was formed in 1949. They united to form Baden-Württemberg in 1952. ^ Berlin has only officially been a Bundesland since reunification, even though West Berlin was largely treated as a state of West Germany. ^ "Results of the referendum on the Saar Statute (23 October 1955)". Saarländische Volkszeitung. Saarbrücken. October 24, 1955. p. 10. Retrieved November 8, 2011. In Germany, the President of the Bundesrat or President of the Federal Council is the chairperson or speaker of the Bundesrat. He or she is elected by the Bundesrat for a term of one year. Traditionally, the Presidency of the Bundesrat rotates among the leaders of the sixteen state governments. This is however only an established praxis, theoretically the Bundesrat is free to elect any member it chooses, and a President could also be re-elected. As well as acting as a chairperson the President of the Bundesrat is ex officio deputy of the President of Germany. The flags of the German states may come in different variants. All states have a Landesflagge, that may be used by anyone. Some states have another variant, often showing the state coat of arms, called the Dienstflagge, normally for use by official government offices only. In addition to these flags, in a few states there are variants exclusively for the state senate, or for state-operated ships. In some cases there are specific flags for high-ranking officials, mainly used as car flags. Frequently, the flags are used in vertical variants. DB Regio AG is a subsidiary of Deutsche Bahn which operates short and medium distance commuter train services in Germany. The Regionalliga is the fourth tier in the German football league system. Until 1974, it was the second tier in Germany and in 1994, it was introduced as the third tier. Upon the creation of the new nationwide 3. Liga in 2008, it became the fourth tier. Most clubs are full-time professional at this level. The Wasserschutzpolizei is the water police that patrols the waterways, lakes and harbours of Germany around the clock. The WSP are part of the Landespolizei. The Federal Police maintains 16 patrol craft and helicopters are part of the Coast Guard (Küstenwache) and assigned to coastal BPOL stations. The watercraft include six offshore patrol vessels, e.g. those of the Bad Bramstedt class, as well as a number of fast inshore vessels and one tugboat. The Landesbanken in Germany are a group of state-owned banks of a type unique to Germany. They are regionally organised and their business is predominantly wholesale banking. They are also the head banking institution of the local and regional bases Sparkassen. Landesbanken and Sparkassen comprise one of the three pillars of Germany's banking system. The two other pillars are private commercial banks and cooperatives. Each has a different legal purpose, ownership structure, and governance model. Landesbanken and Sparkassen, as publicly owned entities, are chartered by national and state banking laws to pursue an "öffentlichen Auftrag" or public purpose. A Naturschutzgebiet is a category of protected area within Germany's Federal Nature Conservation Act . Although often translated as 'Nature Reserve' in English, the Federal Agency for Nature Conservation (BfN) refers to them as 'Nature Conservation Areas'.